Viewers might recognize painter Rebecca Herskovitz’ expressive and large images of women reclaimed from contemporary magazines in her one-night-only solo exhibit, “looking at you looking at me,” at Hoover Studios September 7. Herskovitz’ exhibit is the second in the recently opened studio by Omaha based artist Bill Hoover in the Mastercraft Building. The artists met while working together at The Kent Bellows Studio and Center for Visual Artists so the show is particularly significant to both; She is also especially thrilled to show a new body of work that builds on her previous series. For this current body of work, still maintaining this idea, her ten haunted, sexually charged oil and mixed media pieces convey more vulnerable narrative and intimacy. 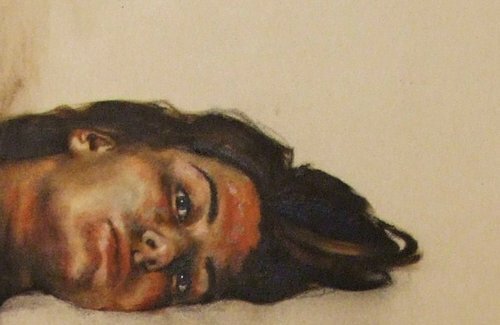 For example, in the title piece, “looking at you looking at me,” the large oil painting of a seemingly spent female face lying down, staring at the viewer, both challenges and connects with the gaze of the subject. Participate in the gaze Friday, September 7, 6-9pm at Hoover Studios in the Mastercraft Building, 1111 N. 13th St., Suite 120. Thereafter for the month, the exhibit will be up by appointment. Billhooverart.com.